The Jaguar that Roams the Mind is a journey into the vanishing world of Amazonian shamanism--an adventure of initiation and return--that explores the unique reality at the heart of the Amazonian healing system. 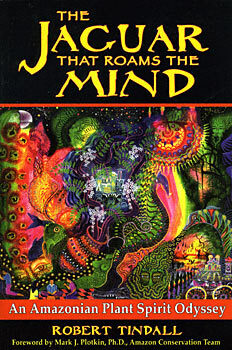 Robert Tindall shares his journeys through the inner and outer landscape of the churches of ayahuasca and with the Kaxinawa Indians in Brazil; his experiences at the pioneering center for the treatment of addiction, Takiwasi, in Peru; and his studies with an Ashaninca master shaman deep in the rainforest jungle. Moving beyond the scientific approach to medicinal plants, which seeks to reduce them to their chemical constituents, Tindall illustrates the shamans' intimate relationships with plant spirits. He explores the three pillars of Amazonian shamanism: purging (drawing disease out of the body), psychoactive plants (including the ritual use of ayahuasca), and diet (communing with the innate intelligence of teacher plants). Through trials and revelations, the subtle inner logic of indigenous healing unfolds for him, including the "miraculous" healing of a woman suffering from a brain tumor. Culminating in a ceremony fraught with terror yet ultimately enlightening, Tindall's journey reveals the crucial component missing from the metaphysics of the West: the understanding and appreciation of the sentience of nature itself. "A beautifully crafted account of a man's psychospiritual healing quest, from his traumatic childhood and early drug addiction, to an ill-fated pilgrimage to the Sahara, to finally finding his path in the depths of the Amazon. Robert Tindall writes with exquisite fluid clarity and fearless, openhearted honesty. The book is a riveting, pleasurable read but is also profoundly sophisticated and deeply informative. I couldn't put it down"